The last time I wrote about this, Math On-A-Stick wasn’t a sure thing. Details are on my Math On-A-Stick page, so click on through for all the latest updates there. We need volunteers, so please help spread the word online and in person. Easter Sunday saw St Paul, Minnesota waking up to weather perfection. Sunshine, low seventies (Fahrenheit), cloudless sky. Truly amazing. There was a loon on Lake Phalen! This was the sort of April weather that brings Minnesotans out of their homes to rediscover their neighbors. So it is with Griffin, Tabitha and me on this warm spring morning. We are enjoying the warm sunshine on our front steps when L (five year old girl), O (3 year old boy) and their mom come biking, biking and strolling (respectively) down the sidewalk. L is on a neighborhood mission delivering handmade Easter greeting cards. 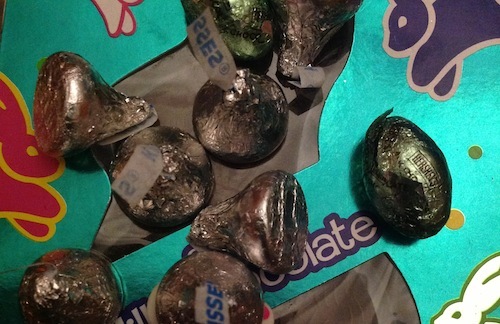 It turns out that she has also pocketed some goodies from her own Easter basket. While we chat, she pulls out a bag of Cadbury mini eggs. In case you are unfamiliar, these are the size of pebbles. They are chocolate inside with a crunchy candy shell. Like an oversized egg-shaped M&M. Each little bag contains about a dozen. This is likely a small fraction of the candy L has consumed by the time she stops to chat. Anyway, mom notices the bag as soon as it emerges from L’s pocket. (Side note—mom is across the street! Holy SuperMom powers!) She warns L not to eat any more of these; arguing that L has had enough candy for one morning. L (5 years old): Please? Mom: If you give everybody one, you can have one. L proceeds to cheerfully open the package, hand one to Tabitha (who eagerly and gratefully receives it), one to Griffin and one to me. I begin to think about what question to ask to get some math talk going. But L is ahead of me. L: Tabitha, do you want a second one? Children use math to their advantage. L knew what mom meant. Mom had compromised on the candy, allowing her one piece. L knew that. And she knew that the process was repeatable. One does not always mean one. One might be taken to mean each. “Each time you give everybody one, you can have one.” This is also a reasonable interpretation of mom’s words. L was rule bending here. But she was also building the precursors of ratios. For every one you give a friend, you can have one. This is a ratio. Giving a friend two and having two fits this rule just as well as giving a friend one and having one. Ratios are one of the more challenging ideas behind multiplication and division relationships, and fractions. What is maddening for parents is at the same time great thinking practice for children. This was a brilliant compromise strategy on mom’s part. I doubt that she intended to encourage L to think proportionally, but that doesn’t matter. More likely, she was trying to encourage the admirable social skill of sharing. By including numbers in her compromise, she opened the door for L to think. As I have mentioned before, anytime your child wants to open a negotiation, there is an opportunity for math talk. Sometimes we parents need to give a flat out yes or no. But when negotiations are feasible, we can get our children thinking. March Mathness continues as I guest post on the Tiggly blog. This week: Operation Conversations. Click on through and enjoy! A month of math in March! This is just a quick note to let everyone know that Talking Math with Your Kids is guest-posting on Tiggly’s blog throughout the month of March. While you’re there, browse around a bit. The folks at Tiggly are super smart, sincere and hard working. They have lots of good resources. This is just a quick note to let you know that Talking Math with Your Kids now has a Facebook page. It will be a place for links and resources as I come across them, and typically before they get worked into posts here on the blog. It can also be a place for quick, informal discussion different from blog comments. You are invited to join the fun over there! Just click on through. 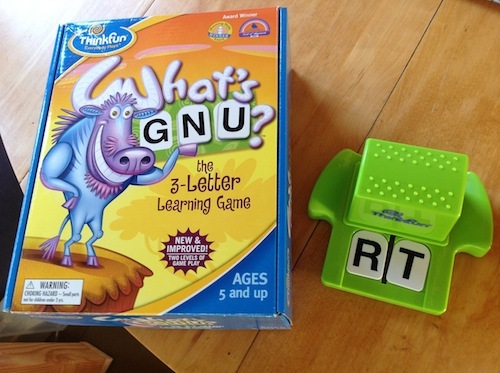 What’s Gnu? A Facebook page! That’s what’s gnu! This image originally appeared in “Talking math with a word game“. While we’re discussing social media, you can find me on Twitter, too. We like to use the hashtag #tmwyk over there. I was talking with Griffin one day when he was in third grade. Me: Do you know what is? My notes on the conversation at this point only have (back and forth), which indicates that there was probably some follow-up discussion in which we located and fixed his error. The details are lost to history. Me: So is 6 because is 12. What is ? G: Half of 12 is 6, and is 2, so it’s 2. Mathematical ideas have multiple interpretations which people encounter as they live their lives. As we learn more mathematics, we become better at connecting these different ways of thinking about ideas. A division fact is a different way of saying a multiplication fact. ( is 6 because is 12). Division tells how many groups of a particular size we can make (Ms. Starr’s class has 13 pairs of students). We were just talking for fun, not homework or the state test. So I wasn’t worried about his connecting those ways of thinking. 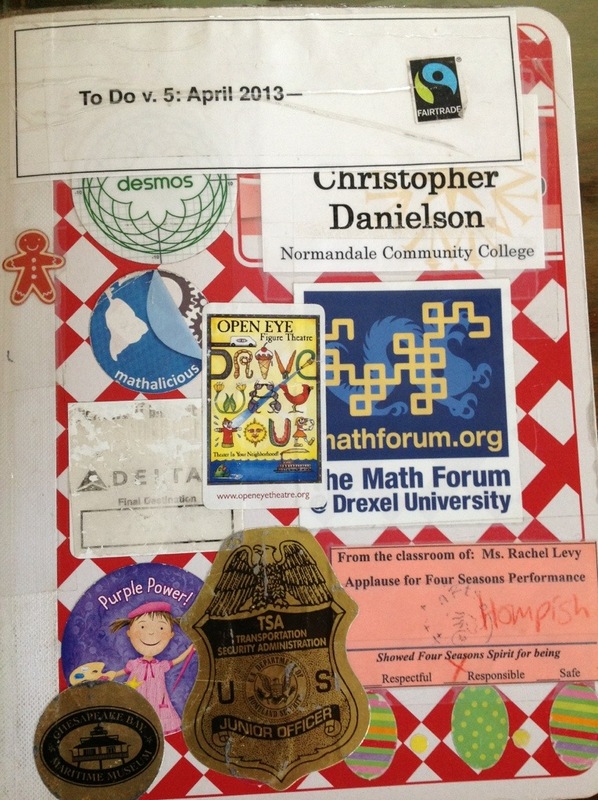 I was just curious how he would apply them to some more challenging tasks, such as dividing by 1 or by a fraction. I was surprised by how difficult was for Griffin. Not because it is an easy problem, but because he could have applied his how many of this are in that? idea, or his multiplication facts idea. But he did neither and reinterpreted the task as twelve divided by half-of-twelve. I was also surprised at the length of the pause he took for . It makes sense in retrospect. After all, are you really making groups if it’s just one group? I imagine he had to think that through, rather than the number relationships involved. When the opportunity presents itself—when you and your child are not under homework stress, not rushing to get out the door or find the dog’s leash; when you happen to be talking about number anyway—ask follow up questions. Even a simple set of division problems got a lot of good thinking out of Griffin. Problems involving 1, 0 and are especially challenging. Vary the size of the numbers. Don’t worry about whether the answers are right or wrong. Keep asking How do you know? and listening to your child’s answer. Offer a few ideas of your own. Quit before anybody gets frustrated or bored. We are delighted to share a short feature in this month’s Minnesota Parent magazine featuring the “Real Dad” behind Talking Math with Your Kids. Share widely, please, and do give Minnesota Parent a bit of extra web traffic, won’t you? Griffin and Tabitha thank you! One question: how are you preserving all these amazing conversations? The answer is surprisingly low-tech. See, I have this notebook. And it’s pretty much always with me and I use it to keep track of pretty much everything in my life. So whenever we have a talk, I write it down as soon as possible afterwards. Usually within minutes. My children are now accustomed to Daddy writing in his notebook as one of many needless delays in their lives. But then it takes them like 10 requests and 20 minutes to get their shoes on and out the door, so I figure we’re even at worst. I have made a few videos of our math talks. But that requires set up which usually spoils the moment. I have made a few audio recordings. But people listening to them have noticed that it’s frustrating not being able to see what we’re talking about. I will share some of each of these in future posts, and you can hunt them down at my blog, Overthinking My Teaching if you need to see or hear Griffin or Tabitha talking math with me. Also, I applied to be a Google Glass Explorer. I never heard back. It strikes me that the first-person view of a conversation could be powerful, and that Glass would mean no set up time. Maybe someday? In the meantime, text and photos are our medium, and the details are captured in a notebook. Photos are mostly from an iPad, which I got from the good people at TED-Ed when I made that “One is one” video. [t]he programs could take time away from activities, like hands-on creative play or face-time with caring adults, that have proven benefits for infant learning. I say, Take no chances! Talk math with your kids! If you don’t let a day go by without reading to them, then don’t let a day go by without asking, How many? or What shape?